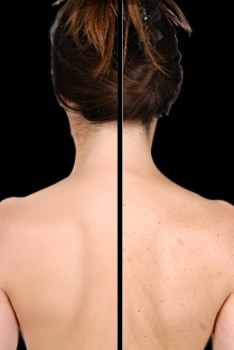 Anti-Acne Back Treatment – a result-centric treatment target tough-to-reach spots, troubled by clogged pores, back acne, and dehydrated skin. When sebum and dead skin cells are trapped within a follicle, a clogged pore is formed. The blockage may become a blackhead and in the event of bacteria invasion, develop into a pimple. Clay Mask contains an intelligent active system that regulates the skin’s natural bacteria flora to hydrates the skin and infuse it with valuable minerals like algae to combats skin impurities and also prevents excessive sebum production. This promotes the growth of healthy bacteria to naturally clear the oil clouts, leaving skin soft and supple. It comes with Cleansing, Steam, Scrub, Extractions and Mask.